The lesson plans on the AGPA website use the Learning Cycle as the instructional model for its lesson plans. The learning cycle rests on constructivism as its theoretical foundation. "Constructivism is a dynamic and interactive model of how humans learn" (Bybee, 1997, p. 176). A constructivist perspective assumes students must be actively involved in their learning and concepts are not transmitted from teacher to student but constructed by the student. In the early 1960's, Robert Karplus and his colleagues proposed and used an instructional model based on the work of Piaget. This model would eventually be called the Learning Cycle. (Atkin & Karplus, 1962). Numerous studies have shown that the learning cycle as a model of instruction is far superior to transmission models in which students are passive receivers of knowledge from their teacher (Bybee, 1997). As an instructional model, the learning cycle provides the active learning experiences recommended by the National Science Education Standards (National Research Council, 1996). The learning cycle used in these lesson plans follows Bybee's (1997) five steps of Engagement, Exploration, Explanation, Elaboration, and Evaluation. As in any cycle, there's really no end to the process. After elaboration ends, the engagement of the next learning cycle begins. Evaluation is not the last step. 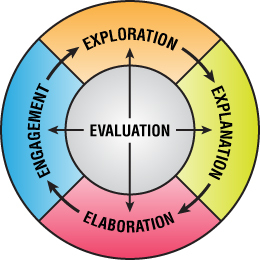 Evaluation occurs in all four parts of the learning cycle. The description of each part of the learning cycle draws extensively from Smith's work. Engagement is a time when the teacher is on center stage. The teacher poses the problem, pre-assesses the students, helps students make connections, and informs students about where they are heading. Focus students' attention on the topic. Pre-assess what students' prior knowledge. Inform the students about the lesson's objective(s). Remind students of what they already know that they will need to apply to learning the topic at hand. Pose a problem for the students to explore in the next phase of the learning cycle. Evaluation of Engagement: Evaluation's role in engagement revolves around the pre-assessment. Find out what the students already know about the topic at hand. The teacher could ask questions and have the students respond orally and/or in writing. Now the students are at the center of the action as they collect data to solve the problem. The teacher makes sure the students collect and organize their data in order to solve the problem. The students need to be active. The purpose of exploration is to have students collect data that they can use to solve the problem that was posed. How well are the students collecting data? Are they carrying out the procedures correctly? How do they record the data? Is it in a logical form or is it haphazard? In this phase of the process, students use the data they have collected to solve the problem and report what they did and try to figure out the answer to the problem that was presented. The teacher also introduces new vocabulary, phrases or sentences to label what the students have already figured out. Evaluation of Explanation: Evaluation here focuses on the process the students are using -- how well can students use the information they've collected, plus what they already knew to come up with new ideas? Using questions, the teacher can assess the students' comprehension of the new vocabulary and new concepts. The teacher gives students new information that extends what they have been learning in the earlier parts of the learning cycle. At this stage the teacher also poses problems that students solve by applying what they have learned. The problems include both examples and non-examples. Evaluation of Elaboration: The evaluation that occurs during elaboration is what teachers usually think of as evaluation. Sometimes teachers equate evaluation with "the test at the end of the chapter." When teachers have the students do the application problems as part of elaboration, these application problems are "the test."